My First Autofocus Film SLR! Guess what I just got, sitting in between the Minolta X300 manual-focus film SLR (left) and Sony Alpha A100 digital SLR (right). Squint no more, geeks! 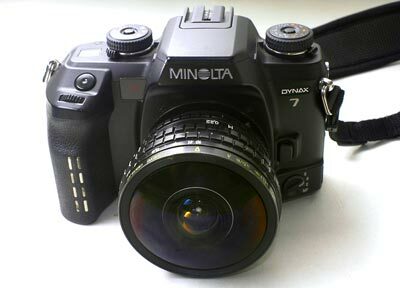 It’s the legendary Minolta Dynax 7. 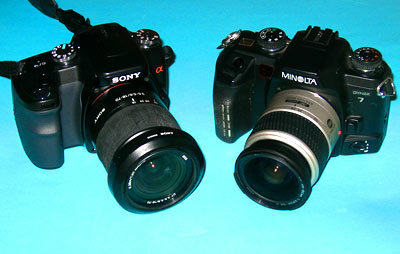 Compared to the Sony A100, you can immediately see that it’s a button and knobfest. I know people who love it that way. I know I do. The main dial controls exposure mode (where the center button must be pressed to unlock the dial); a dial below it controls drive mode, with options like multiple exposure and mirror lock up after 2 second self-timer; a knob controls metering, including an AEL (Auto Exposure Lock) button; a knob controls focus point selection, while the 9-point directional pad chooses the focus point, aligned perfectly on the rule of thirds. In front of the shutter release button is one dial; behind the shutter release is a tiny LCD to show film frame count, and aperture. The dial behind can be used to dial in a custom exposure quickly. Yes, this stroke of genius just arrived on the Canon EOS 1Ds Mark III! 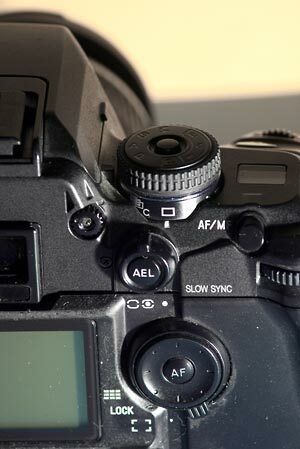 Also, when AF mode is set to Automatic AF, and the lens is focused, the focusing motor screw will disengage from the lens to use Direct Manual Focus mode. You can then fine-tune focus without spoiling the focusing motor! Pentax has a similiar implementation called Quick-Shift Focus System to give their lenses something like full-time manual override focus. 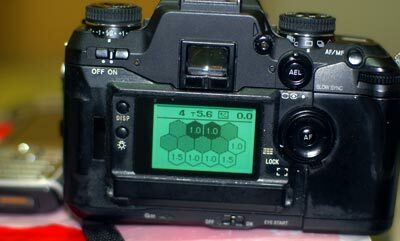 On the left hand, there’s the exposure compensation dial, which goes from -2 to +2 in 1/3 stops, and -3 to +3 in 1/2 stops. This also needs the middle button to be pressed to turn. There is also a flash exposure compensation dial right below it. 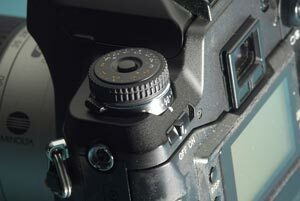 For some reason, Minolta said that their On/Off switches should be on the left, and that decree carried on to the Konica Minolta digital SLRs and the Sony A100. Frankly, it does not bother me. Have you found the switch on the Canon EOS 30D? There is also a dial on the right of the camera to switch from red-eye reduction flash, normal flash, rear-sync flash and wireless flash (with adjustable 2:1 ratio). Left: The data back. I LOVE THIS! It stores exposure data for the last 7 rolls shot with the camera. Scouring through, I could tell that the previous owner used the Minolta 28-80mm F3.5-5.6 lens and something at 150mm F5.6. He/she also used it with bright studio lighting, based on the smaller apertures (F11) and yet fast shutter speeds (1/500s). The last recorded date was somewhere in April 2003; after that, the camera time was reset to January 1st, 2000. I can only wonder why he/she didn’t get the Minolta 24-105mm F3.5-4.5 lens instead. Budget, I guess. I got this and the 28-80mm at a second-hand pawn shop for RM399. Right: The bitmapped screen is genius. 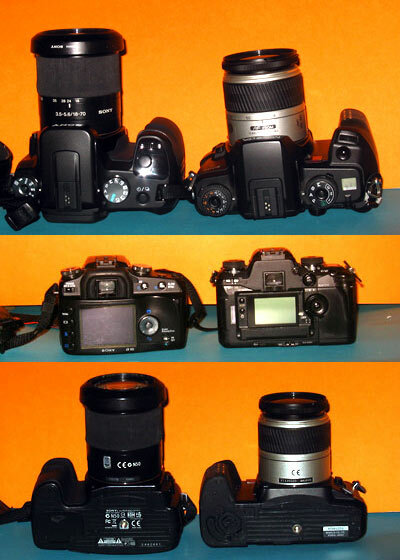 Not only does it show your status and aperture/shutter settings in one go (like Konica Minolta SLRs, Sony A100, Olympus dSLRs, Panasonic L1, Nikon D40/D40x, Canon 400D), it can also be used to view the custom function text. Yup, no more cards and guessing what custom function number does what! Personally, I never liked the idea of having a status LCD screen on top; when you switch to portrait orientation, you have to peek over the body to look for a tiny LCD that till today’s Nikon D80, still looks like a Game&Watch. The Dynax 7 reorients the screen when you turn it sideways! …also, the LCD screen on the back has led many to think my Dynax 7 is a digital SLR. Heh. Left: Miss the depth of field markers on your zoom lens? Worry no more, pressing the Depth Of Field preview button shows how much depth of field you get in front and behind the subject at your set aperture. This feature only works on Minolta/Sony D lenses, though, as it needs the distance information from the lens. Right: The standard status LCD. Direct Manual Focus, Release Priority, single-shot drive mode, no exposure compensation, center AF point, multi-segment metering, 26th frame. And now, for a rant. I love Aperture Priority mode. I value having instant control over my depth of field. I honestly think that having your camera on Manual Exposure mode all the time is a very impractical thing to do, especially when racing to balance the exposure when you should be worrying about shutter speed or aperture alone. If I need as fast a shutter speed or am shooting in dark places, I quickly flick the dial to choose the brightest aperture. If I’m capturing a sunny landscape or macro, I quickly flick the dial down to F16. If I’m shooting a sunny portrait and I wanna show your pores, I’ll flick to F8 to get more sharpness out of the lens. Backlit subject? Bump up the exposure compensation. At no point should I have to worry about balancing shutter speed too. Frankly, people who roll two dials frantically look silly. Get with the program, yo. And yes, it does annoy me when somebody picks up my Sony A100 and switches to Manual Exposure to take a shot that has no need for M mode. While it does show that the person has knowledge of aperture/shutter/ISO and its relationships, it is hardly practical nor smart. So why did I go out and get a Minolta film SLR? I could use the Minolta 50mm F1.4 lens on a body it was meant to be used on, where 50mm is sweet. I could even walk around with the Minolta 70-210mm F4 beercan without having to step back much, being used to the Sony A100 with 50mm F1.4 giving a similiar telephoto feel. This entry was posted in Geek, Pictures, Rants on June 6, 2007 by 2konbla.